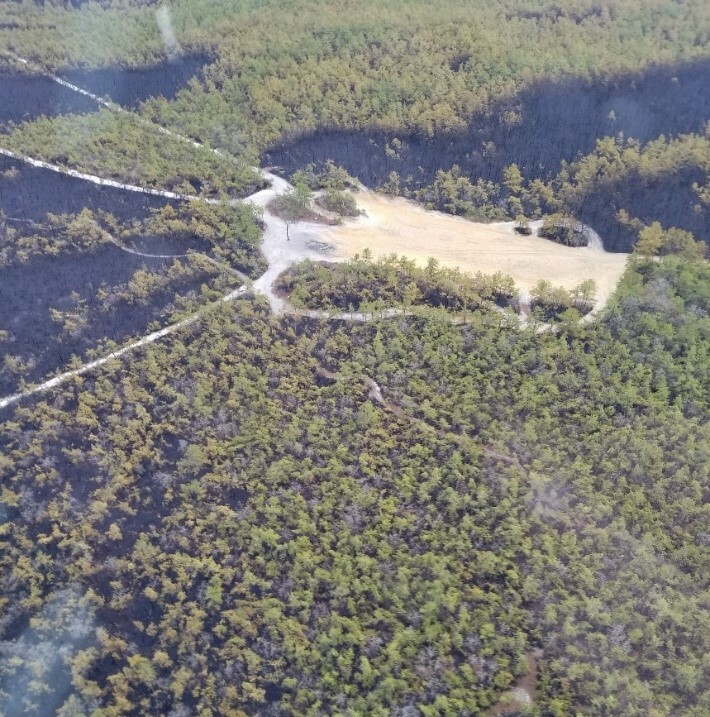 (19/P022) TRENTON – A wildfire that consumed 11,638 acres of lands in the Pinelands region of New Jersey is fully contained and all roads around the fire are open, Department of Environmental Protection Commissioner Catherine R. McCabe announced today. The fire, one of the largest in recent New Jersey history, occurred Saturday in a remote section of Penn State Forest, in Burlington County. The cause is under investigation. Fire officials today announced they have ruled out prescribed burning, power lines and lightning as causes, but seek the public’s help in providing information about the fire. All tips will be kept confidential and may be called in to New Jersey State Police Detective Sgt. Shaun Georggson at the Tuckerton barracks, (609) 296-3132. There were no injuries, property damage or evacuations. The fire is 100 percent contained, meaning there is a perimeter around the fire to stop its forward progress. Deeming the fire under control means there is some burning occurring inside the perimeter, but the exterior of the fire should not expand. Firefighters will continue to monitor the situation to make sure that no fire embers escape the perimeter. 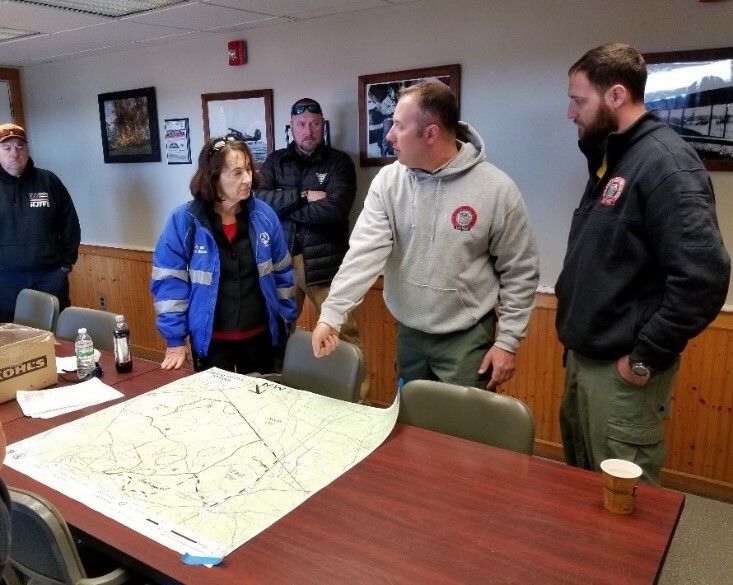 Commissioner McCabe surveyed the area by helicopter this morning and met with Forest Fire Service officials for updates. Prescribed burns help reduce forest fire risk before prime wildfire season, which is typically in April and May in New Jersey. At that time of year fallen leaves, branches and twigs are abundant, daylength increases, humidity can be low, and it is often warm and windy. Those weather conditions coupled with lack of new leaf growth makes forest debris more susceptible to the drying effects of wind and sun. The Cedar Bridge and Apple Pie Hill fire towers detected smoke Saturday afternoon and immediately began dispatching units to fight the blaze, which spread quickly. A combination of firefighting techniques and changing weather conditions throughout the weekend helped firefighters reach containment status. The State Fire Marshal, the State Park Police, New Jersey State Police and Burlington County Prosecutor’s Office are assisting the Forest Fire Service with the investigation. To learn more about wildfires in New Jersey, steps to protect property, and other resources, visit www.njwildfire.org. Follow the DEP on Twitter @NewJersey DEP. Top: DEP Commissioner Catherine R. McCabe is briefed on the fire’s status by Forest Fire Service personnel. Bottom: An aerial view of the fire’s suspected area of origin in Penn State Forest.